Significantly, this language appeared in the Security Council's statement condemning terrorist act in Mumbai back in November 2008, but was dropped in the July 13, 2011 statement on Mumbai, once India got on the Security Council. Some continue to ask, what changed: India's position, or its power? On September 7, Inner City Press asked the month's Council president Nawaf Salam about the missing human rights rights, and if India was responsible for the omission. Salam said the draft was circulated by India and that "no one raised that question, among the members." Video here, from Minute 1:40. This was later qualified, and the UK Mission to the UN spokesman confirmed to Inner City Press that the UK "raised" the issue, on the grounds that the Council should be consistent including in how it treats member states serving on the Council. But the UK, whose Foreign Secretary William Hague quickly sent India his "deepest condolences," did not "break silence" or delay the press statement. India thanked the UK for its support. While countries are loath to question each other in the wake of televised tragedy, it appears this issue may be coming to a head. Already two Council members, on Permanent and one for now only elected, have exempted themselves from the human rights language. When a third Council member makes its move for exemption, what will happen? When a terrorist attack like today's occurs, the UN Security Council members issue ritualized press statements. They use templates, because they see a need to respond the same day as the attack, and there is not time to negotiate a brand new statement for each incident. The same language is found in Security Council press statements about terrorist attacks in Afghanistan. Later on Wednesday, after the Council's Mumbai statement, Inner City Press asked Afghan Permanent Representative Tanin about the statements. He indicated that Afghanistan gets the Council's normal treatment. This was true -- that is, the human rights language was included -- in Council statements about Afghanistan in on February11, 2009 (Kabul), on August 26, 2009 (Kandahar), on October 8, 2009 (Kabul), and on October 25, 2010 (Herat). This year the human rights language has been in the Security Council statements on Morocco (April 29, 2011) and Belarus (April 10, 2011). But on July 13, 2011 when German Permanent Representative Peter Wittig read out the Council's press statement about the three Mumbai bombings, he immediately began walking away from the microphone. Video here. Inner City Press asked the first, and only, question: was there any discussion of who was responsible for the bombings? There was no discussion of responsibility, Ambassador Wittig said, and left. There was another question, which while it seems Wittig would not have answered remained puzzling to some: the omission of the human rights language. There have been at least three recent exceptions to this template, other than the July 13 omission on Mumbai, all three regarding a Permanent Five member of the Council. India is not a Permanent member, at least not yet. But India, perhaps as a reflection of its newly muscular foreign policy or economic heft, seems to some to have requested and gotten that same treatment. The death of innocents is of course to be condemned. But the Security Council speaks in words. So how terrorism is condemned must be covered, comparing both statements about different countries and about the same country in different years. We will have more on this. The members of the Security Council condemned in the strongest terms the terrorist attack that occurred in Delhi, India, on 7 September, causing numerous deaths and injuries. They expressed their deep sympathy and sincere condolences to the victims of this heinous act and to their families, and to the people and Government of India. The members of the Security Council reaffirmed that terrorism in all its forms and manifestations constitutes one of the most serious threats to international peace and security, and that any acts of terrorism are criminal and unjustifiable, regardless of their motivation, wherever, whenever and by whomsoever committed. 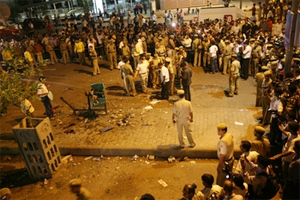 The members of the Security Council condemned in the strongest terms the terrorist attacks that occurred in various parts of Mumbai, India on 13 July 2011, causing numerous deaths and injuries. They expressed their deep sympathy and sincere condolences to the victims of these heinous acts and to their families, and to the people and Government of India.